These brakes are better than any I have ever seen. In traffic with a load on a hot day, Ebc pads grab without any problems. 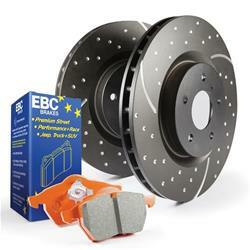 Oem pads can not even come close to the performance of EBC. Well worth the money. I got thee to replace the stock warped rotors on my 2014 Silverado. The kit fits perfectly and this pad and rotor combo have much improved brake feel over stock. The only con to this kit is it does not include and replacement hardware, IE the abutment clips that the pads ride on.